ALWAYS use the Floor Mat Anchors to attach the front floor mats to the vehicle. The anchors on the front floor carpet keep the floor mats from sliding forward. 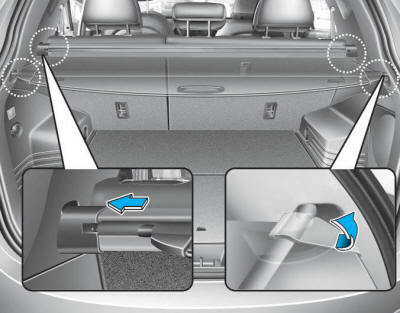 Your vehicle was manufactured with driver's side floor mat anchors designed to securely hold the floor mat in place. To avoid any interference with pedal operation, HYUNDAI recommends only the HYUNDAI floor mat designed for use in your vehicle be installed. ALWAYS ensure the floor mats are securely attached to the vehicle's floor mat anchor(s) and do not interfere with the accelerator or brake pedal before driving the vehicle. Use only the HYUNDAI floor mats designed for use in your vehicle. Do not stack floor mats on top of one another (e.g. all-weather rubber mat on top of a carpeted floor mat). Only a single floor mat should be installed in each position. Do not place anything on top of the driver side floor mat. Do not place the floor mats bottom- side up or upside down. To keep items from shifting in the cargo area, use the luggage net. Make sure the luggage net is securely attached to the holders in the cargo area. 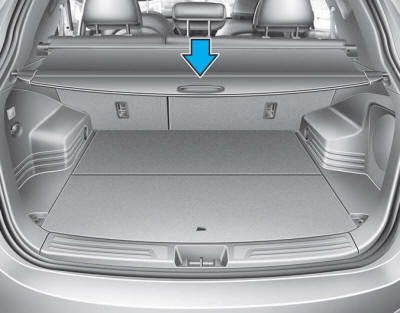 Use the cargo security screen to hide items stored in the cargo area. 1. 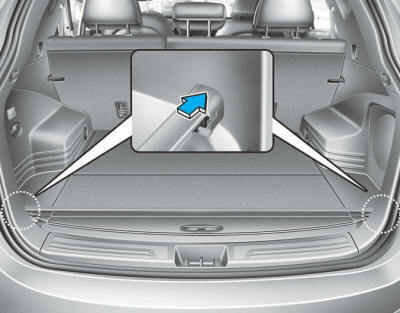 Pull the cargo security screen towards the rear of the vehicle by the handle. 2. Insert the guide pin into the guide. 2. The cargo security screen will automatically retract. The cargo security screen may not automatically retract if the screen is not fully extended. If this is the case, pull out the screen, then slowly allow it to retract. 2. While pushing the guide pin, pull out the cargo security screen. Do not place objects on the cargo security screen. It may damage the cargo security screen.